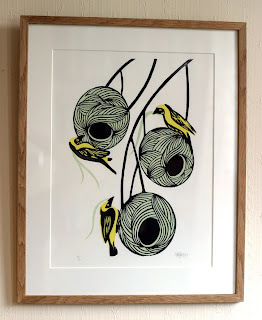 A new print and exciting news! 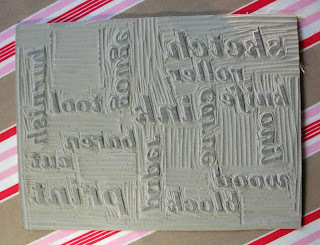 I like making word clouds - here's one made up of some of the most used words here on the blog. I think the fact that 'Lovely' is so large shows up that I've been writing far more posts than Jon recently! 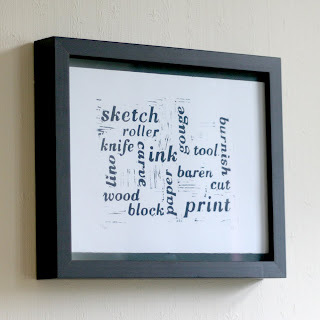 Make your own at Wordle. 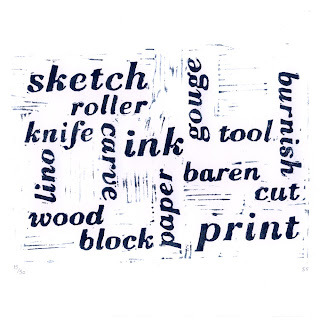 So last night we printed a new linocut - a little word cloud full of printmaking words like ink, paper and burnish. 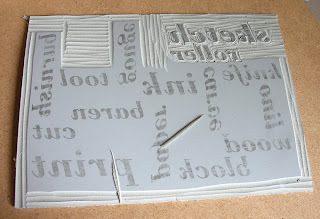 Here's the block in various stages of being cut - backwards lettering can be fiddly sometimes! Meanwhile, Jon is busy drawing birds for a new print which he's hoping to start cutting this weekend. 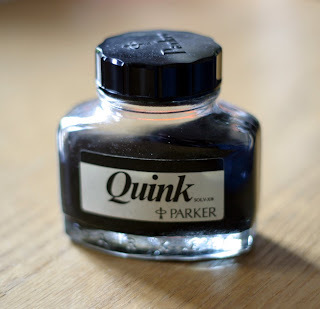 A good excuse to break out some ink. Tonight we are looking forward to popping into the private view of Celia Hart's new exhibition in Verandah on Upper St Giles Street. If you're in Norwich in May then do go and see it! At last! They are finished! 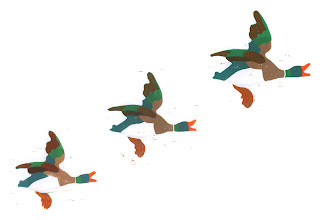 I started this trio of flying ducks 9 months ago, but for various reasons they got put on the back burner. 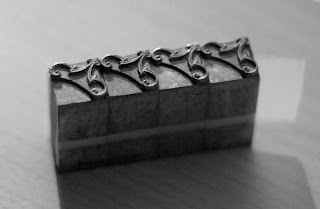 But this week I've finally had a chance to finish cutting the blocks and print them. 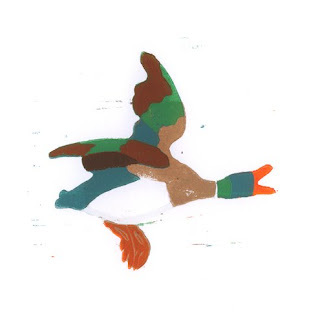 Each duck is an individual print - a 7 colour reduction linocut. The biggest measures 18cm across, the smallest 9cm. 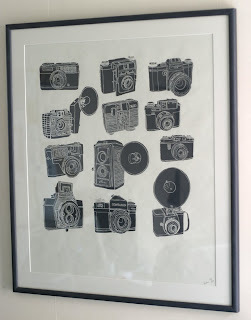 I'm really looking forward to having a set framed, and on the wall! There is a set in our Etsy shop and our Folksy shop now. 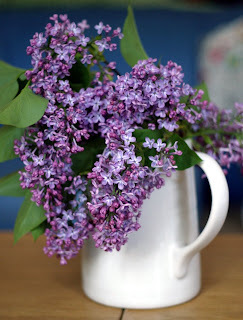 Today I picked some of the lilac from the garden and filled up several jugs with it - the smell is slowly pervading the whole house... Lovely! We have a friend coming to stay this weekend - tomorrow night we are going to see Pride and Prejudice at the Maddermarket Theatre for another friend's birthday treat. Hope you all have a good weekend too! We have been enjoying some beautiful sunshine for the last few days - the garden is bursting with greenery! It's lovely to sit outside and have morning coffee, rather than staying indoors. 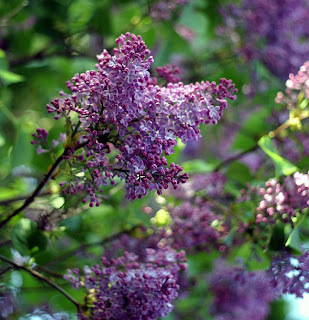 The lilac in the garden has bloomed, and smells wonderful. Tomorrow I'm going to pick some for the house. 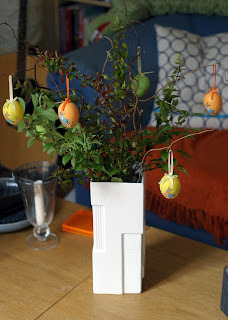 Well, actually Jon will pick them since it requires the use of a step ladder (I am not to be trusted...). 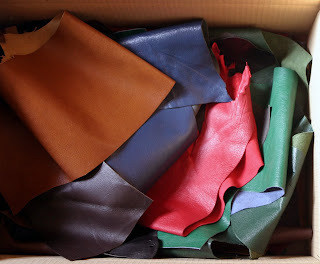 And a box full of leather offcuts for bookmaking from the Midlands - lots of black, as well as dark brown, tan, cherry red, dark green and a nice foresty green, and navy blue! We're looking forward to making some new journals with it all over the next couple of weeks. 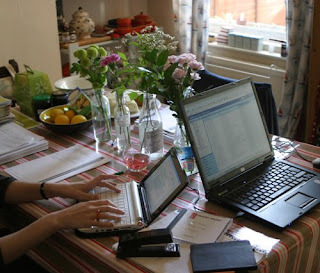 Although the leather will probably be enough to keep us going for several months! 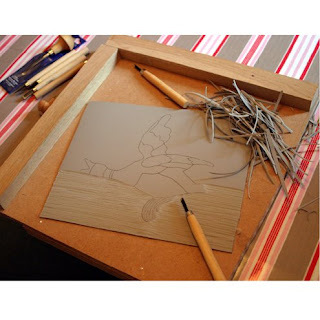 We've also been busy printing reduction lino cuts - they should be finished by tomorrow afternoon, so we'll post about them once they are finished. 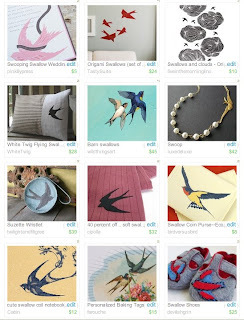 In the meantime have a look at our Etsy treasury here. Jon's ordered his gown for graduation this week - he gets to wear a bonnet, no less. 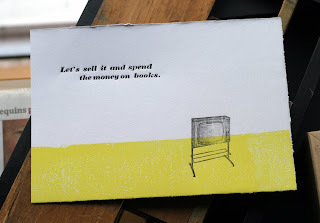 Let's sell it and spend the money on books. There are copies in our Folksy and Etsy shops now, as well as some newly listed hand bound journals too. 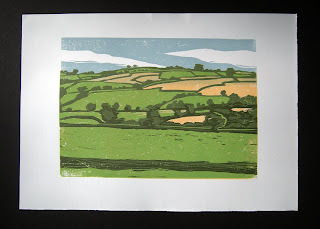 Today we're really pleased to be featured on Sam's Inklore blog (one of our favourites). 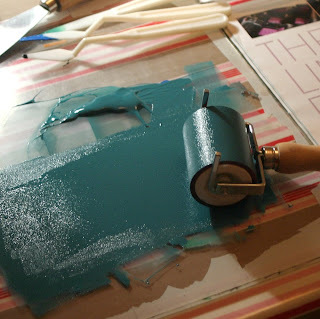 Sam is another printmaker who makes the most wonderful block printed fabrics for the home. I especially love the 'no tie' hydrangea apron in her Etsy shop. ...and one of some weaver birds and their intricate nests. Mark's Etsy shop is here, and he has his own website too. The photo doesn't really do it justice and it is pretty big - 79cm x 70cm. 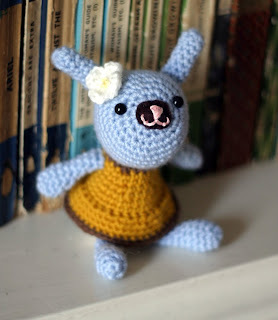 And this morning the most adorable amigurumi from hannah-chan arrived in the post. 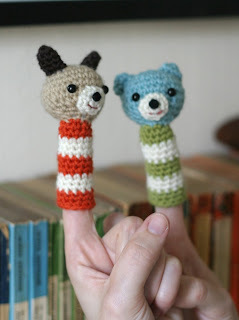 ...and the most adorable finger puppets ever. 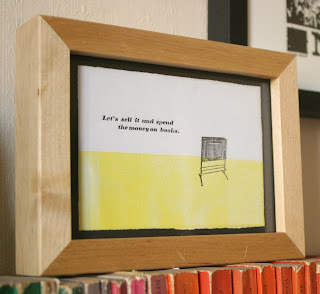 Have a look in hannah-chan's Folksy shop, and her blog - they are so lovely, I want more! 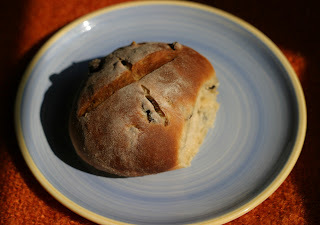 Today we made a big batch of hot cross buns using our favourite teacake recipe. 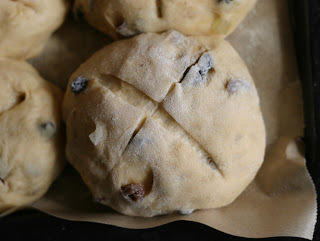 We slashed the tops in the shape of a cross, rather than using dough crosses because I always end up picking them off anyway. They were quite delicious toasted with a cup of tea after an afternoon spent tidying up the garden. 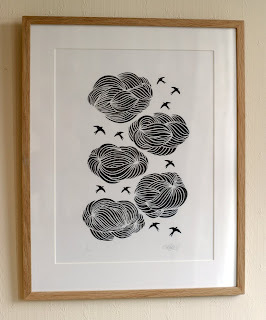 We have been working hard all week so we are looking forward to our weekend off which will be spent baking, gardening and relaxing (and no doubt planning the next print...). 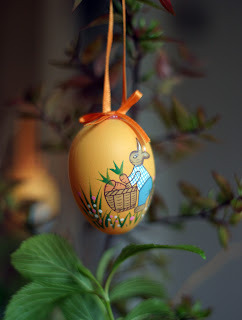 ...and some sweet little egg decorations from John Lewis. It was really sunny for most of the day, so we took advantage of the nice light to take some photos of our leather bound journals to list in our Folksy shop. 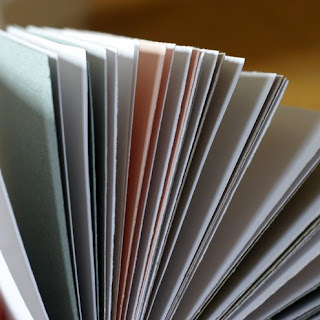 This is our favourite photo, white paper with a few pastel coloured pages. Have a proper look here. Cotehele is a lovely, rambling old house in Cornwall owned by the National Trust. We've been there several times when we've been down in Devon and Cornwall - it has a great 18th century triangular prospect tower (there is another one tucked away on a side street in nearby Plympton too). 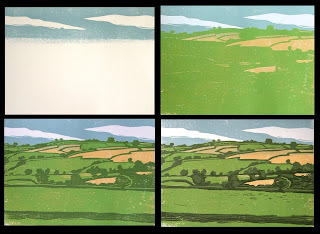 Jon's new print is the view from the top of the Prospect Towers - a five colour reduction woodcut. 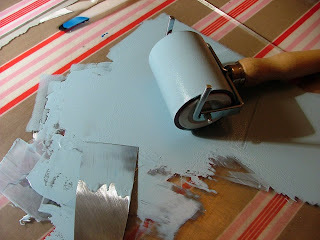 Here is the blue ink being rolled out for the first layer of sky. The sky was followed by a creamy yellow for the arable fields, followed by three layers of green for the pasture fields and the trees and hedgerows. In our Etsy and Folksy shops now. Well, we are home from a lovely day out at Handm@de Cambridge. 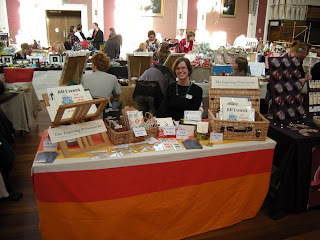 Here is our little stall! We had a fun day, the sun shone, and lots of people stopped by to say hello including Celia (we love her work, and her blog Purple Podded Peas), one of my students from UEA, our little nephew Gabriel (along with his Mum and Dad), and some of our lovely blog readers (hello!). It was hard not to resist spending all our taking on other stalls (I am still coveting this necklace by Claire Howison), but I got some lovely earrings from corryvreckan, and we got some sweet Gocco bicycle cards from Paperleaf. Too lovely to send!